Republicans' Secret To Success? Sound And Act More Like Democrats : It's All Politics The Republican National Committee report offers the party a way forward after its 2012 failure to defeat President Obama, who was long seen as vulnerable because of a relatively high jobless rate and uninspiring economic growth. 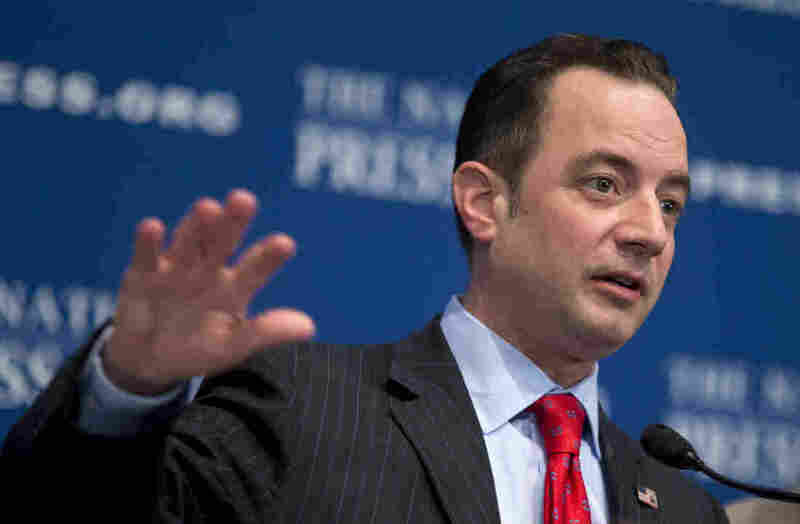 Republican National Committee Chairman Reince Priebus speaks at the National Press Club in Washington, D.C., on Monday. If Republicans hope to recapture the White House in the foreseeable future, they basically need to sound and campaign more like Democrats. The report does not literally advise Republicans to mirror their opposition, but that's one way of looking at a Republican National Committee report officially released Monday that offers the party a way forward after its 2012 failure to defeat President Obama, who was long seen as vulnerable because of a relatively high jobless rate and uninspiring economic growth. Reince Priebus, the RNC chairman, made it clear during a Washington speech that the Republican officials who produced the report after conducting research and voter focus groups didn't find that it was the party's ideology that made it unattractive to so many voters, especially women and minorities. Instead, it was how Republican officials and candidates delivered their message to voters that failed the party, Priebus said. "To be clear, our principles are sound. Our principles are not old, rusty thoughts in some book. Freedom and opportunity are ever-fresh revolutionary ideas. "They're the road map to American renewal in a new and interconnected world. "But the report notes that the way we communicate our principles isn't resonating widely enough. Focus groups described our party as narrow-minded, out of touch and, quote, 'stuffy old men.' ... The perception that we're the party of the rich, unfortunately, continues to grow. That's frustrating because we care about every voter." Thus, one recommendation was that the party work hard to rebrand the GOP, which has long stood for Grand Old Party, into the "growth and opportunity party." Early on, the report's author's sound somewhat envious of the Democrats' approach. "... While Democrats tend to talk about people, Republicans tend to talk about policy. Our ideas can sound distant and removed from people's lives. Instead of connecting with voters' concerns, we too often sound like bookkeepers. We need to do a better job connecting people to our policies." Though few Republicans disagree with their party's need to appeal to more voters, the report's authors triggered controversy with their recommendation for changes to the presidential primary process. They recommended condensing the lengthy period for primaries, ostensibly to move the convention up to early summer instead of late summer to allow the nominee more time to campaign in the general election. Another recommendation was for the party to jettison the practice of caucuses like in Iowa, in favor of primaries. The report's authors argue that primaries can bring new voters to Republican candidates unlike caucuses that tend to attract party activists. Both changes could increase the advantages of an establishment candidate, however, which makes them anathema with non-establishment Republicans like those in the Tea Party movement. That the report's authors were all part of the establishment, with some having ties to the two Bush presidents and former Florida Gov. Jeb Bush, likely won't make that recommendation more palatable to many in the Republican grassroots. "The Republican Party must be the champion of those who seek to climb the economic ladder of life. Low-income Americans are hardworking people who want to become hardworking middle-income Americans. Middle-income Americans want to become upper-middle-income, and so on. We need to help everyone make it in America. "We have to blow the whistle at corporate malfeasance and attack corporate welfare. We should speak out when a company liquidates itself and its executives receive bonuses but rank-and-file workers are left unemployed. We should speak out when CEOs receive tens of millions of dollars in retirement packages but middle-class workers have not had a meaningful raise in years." The report didn't mention Republican presidential nominee Mitt Romney's infamous "47 percent" gaffe or how his background as head of a private-equity firm, whose executives became richer while some workers from companies they restructured were laid off, hurt his campaign. But that clearly seemed to be on the mind of the report's authors. President Obama won re-election partly due to his campaign's use of the latest technologies for voter-outreach efforts, which were constantly tweaked. Obama's campaign was also deeply informed by social science research that showed that voters contacted by neighbors instead of robocalls were much more likely to turn out on Election Day for the president. Republicans clearly intend to copy these and other practices. But none of this will make much difference if the party doesn't address its weaknesses with certain demographic groups like Latinos, who gave more than 70 percent of their votes to the president. "We will take our message to civic centers and community events where people live, work and worship. This new approach will be diverse, year-round, community-based and dedicated to person-to-person engagement. By May 1st we will hire national political directors for Hispanic, Asian-Pacific and African-American voters. "We will task each director to build the team to educate each community on the history and principles of the Republican Party and identify supporters. "This will be a bottom-up approach and will have a network of hundreds of paid people across America, from the community level up to the national level, dedicated to minority, youth and women inclusion. We will conduct a pilot program in targeted urban markets to test and refine these engagement efforts."